Some of the locals told us that the wild Idaho huckleberries in these parts should be ready for picking in early August. Driving through the mountains on a dusty forest service road, scouting for firewood on a hot July afternoon, we stumbled upon some huckleberry bushes along the side of the road that were loaded with ripe berries. To everyone’s surprise, the berries ripened early this year. Not prepared for picking and collecting, we emptied out our water bottle and began carefully picking each precious small berry one at a time. The knee high bushes were sagging with all the weight from the plump blueberry-sized berries. Just about the time we thought we’d found the mother lode, we’d holler to each other, “Come look at this bush!” We picked and picked until our fingers were stained dark purple and we realized the time and had to stop the obsessive madness. Our haul was enough to use some berries fresh and freeze a few cups for later use. 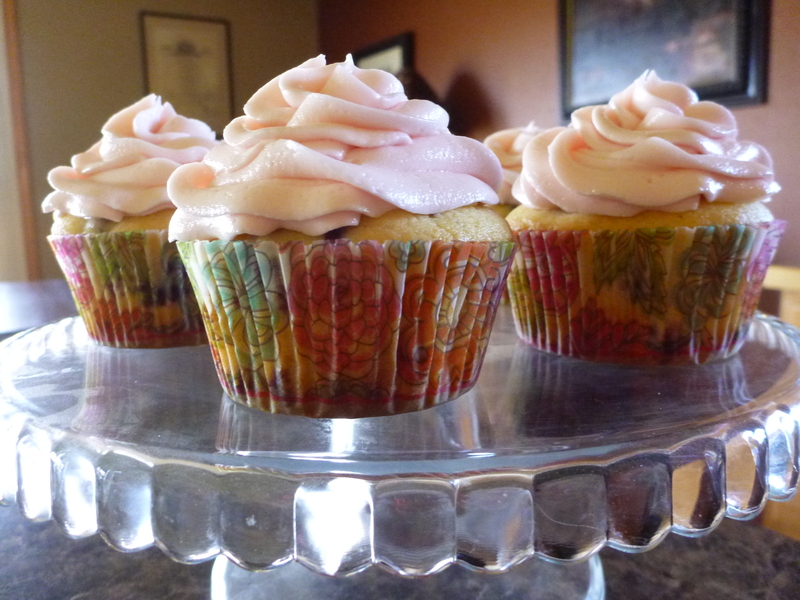 We made huckleberry pancakes, the popular homemade huckleberry ice cream, and I came up with this new recipe for huckleberry cupcakes with huckleberry scented frosting using some of frozen berries. The bears had a good year and so did we. Cream together sugar and butter. Add eggs, milk, flour, and baking soda. Wash berries and then flour. Fold berries into batter. Fill cupcake liners about 3/4 full. Bake at 350 degrees for 25 minutes or until tops are lightly browned. Juice from about 1/4-1/2 cup of smashed huckleberries. Beat butter for a couple of minutes until soft. Add 3 cups powdered sugar to butter and beat on low speed until blended. Add vanilla, salt, 2 Tbsp milk/cream, and huckleberry juice and beat for 3 more minutes on medium speed. Adjust spreading consistency by adding more sugar or milk/cream. If you desire more huckleberry flavor and color add more juice.